Worked on various integration and improvement projects within AutoTrader.com's dealer-customer application, providing wireframes, mock-ups and details UI Specifications. For example, redesigned an application used for placing Offers and Incentives on vehicles within the main application improving overall usability, increasing flexibility, and speeding up the overall process. Created designs, while working with Product Innovation, for Windows 8 Metro and Samsung TV apps. Also created the first design for the company in the automotive ecommerce space and had patent filed for the design and its interactions. Worked to integrate access to Autodesk's version control software via SharePoint utilizing custom web parts, web part pages, and a web page. Responsible for providing mock-ups, design documentation, and conveying design ideas and goals to Chinese development group. Provided guidance relative to the user interface via mock-ups and worked directly with Hanna Strategies' CEO, Product Management, and Development. Suggested the use of AJAX and provided input for implementation as to provide a better user experience. Assisted in the development of CSS and HTML code and the design of presentation materials as well. Initially conducted heuristic evaluation to make incremental improvements to existing application. Then, responsible for the complete re-design of the web client to improve its overall usability during the next software release with Hanna Strategies. Provided taskflows, mock-ups, and detailed design specification. Also worked to clean-up the existing interface for the full-blown, web-based version of the software utilizing a MS Outlook paradigm. Performed basic heuristic evaluations and provided suggestions for improving the overall application for Autodesk's Productstream while at Hanna Strategies. Responsible for all mock-ups and detail design specification for a heavily collaborative effort with Autodesk's Development to design a reporting feature to be used in a Chinese marketplace-specific version of the data management application. While at Vertical Thought, gathered, translated, and wrote requirements, provided wireframes and design documentation for debt collections application. This application contained a business rule engine, a messaging system, document management, reporting, business intelligence, and user portals. Performed heuristic evaluations and provided taskflows, wireframes, screenshots, and design documentation for two different web application and kiosk projects related to medical records and patient information with Vertical Thought. 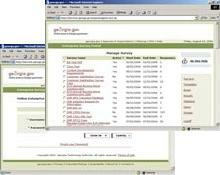 Tested, wrote online help, and conducted training courses for this Georgia Technology Authority application. Cleaned up existing layouts and CSS code. Performed heuristic evaluations and completed UML task flows and wireframes for redesign efforts. 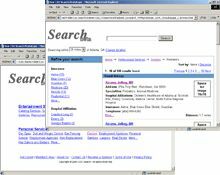 Provided wireframes, screenshots, prototypes (validated XHTML and CSS), color palettes and graphics to business owners for new search engine/directory (Endeca) application being developed by Cox Enterprises (Cox Search, now Kudzu.com). 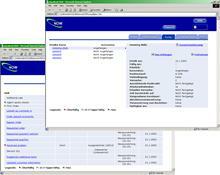 Responsible for the design of the new wizard-driven interface for this Witness Systems reporting application. Provided wireframes, UML task flows and high-fidelity prototype for existing product. Responsible for transferring original design from a Microsoft Management Console (MMC) environment to an HTML-based environment. Created new information architecture, layout, and functionality. 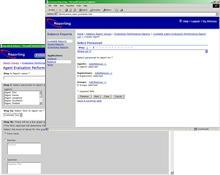 Provided storyboards, wireframes, UML task flows and high-fidelity prototype, etc. for this Witness Systems back-end application. Also participated in numerous Usability tests and efforts with product. Helped to clarify and refine requirements. Provided storyboards and screenshots for new design concepts of a scorecard and relational browser as well as input for the existing Witness Systems BI products. Provided high-fidelity prototype, all graphics and built out front-end (XHTML, CSS, etc.) for this Witness Systems screen capturing application. This project shaped the consistent look and feel of future, web-based applications at Witness. Awards: Won 4 industry awards and 1 personal award upon introduction: Jan. 2002 - "2001 Product of the Year" - Communications Solutions magazine, Nov. 2001 - "Editor's Choice" - Customer Interface magazine, Jan 2002 - "Editor's Choice" - Customer Inter@ctions Solutions magazine, Fall 2001 - "Best of Show" - Internet World. I was awarded the "Engineering Excellence Award," 1st Quarter 2001 for my work on this application. Responsible for the graphic upkeep of existing login and menu for applications. Provided graphics and guidelines for the existing Witness Systems login interface. Also provided login designs and functionality for a survey and forms tool at the state and a debt collections application at Vertical Thought. Responsible for transferring designs from a Java Swing environment to an HTML-based environment, including a business rule engine. Provided storyboards, wireframes, prototypes, and icons for the existing Witness Systems voice and data recording product. Provided wireframes, screenshots, and icons for existing product to satisfy project requirements and change control requests. Produced task flows and function to task matching for existing application. 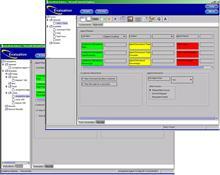 Provided prototypes in German for the internationalization of this Witness Systems e-learning management product. 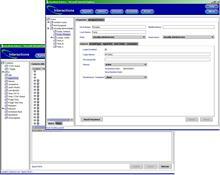 Provided icons and various design input for existing Witness Systems forms application. Lead design of the Spanish version of the A.D.A.M. Health Illustrated Encyclopedia (10,000 pages) at DrTango.com. Ecommerce set up with Cart Manager shopping cart and Cardservice International credit card processing for Wolff Systems.